There are many things, which come in our life and go about. They may influence us in one-way or another. They may change the way we perceive things and can totally change our outlook towards life and towards that thing as a whole. But we may remain cautious about the way they influence us. There are many things, which do not require much deliberation we give them and sometimes the tiniest thing ignored can have colossal influence in our life. We need to differentiate between an almond and a groundnut. Now talk about groundnut first. All of us have seen a 'madari' (juggler). He carries a monkey, which does all kind of acts as ordered by the master. A perfect slave. But all of us don't know how the madari enslaved that monkey to do the tricks. The madari goes to jungle. He takes a small box, puts some groundnuts in the box and attach it to a tree. He makes a round hole in the box, which is just good enough to put your hand in, the way women put their hand in the bangle. The madari sits nearby hiding himself behind something, just waiting for the monkey to come. The ill-fated monkey puts his hand in the box to take out the groundnuts. He take hold of the groundnuts in his fist and try to get his hand out of the box. But it won't come out (compare with wearing a bangle). Does the monkey struggle for his liberation? Yes he does. But the desire of holding on to the groundnuts overtakes him because that is what he has come there for. The monkey struggles indefatigably but he never stops thinking of the groundnuts. He puts his hardest effort to get out of the trap. Eventually gets drained out of his energy. Madari then emerges and puts a rope around monkey's other hand and gets that box detached from the tree. The game is over for monkey. Then comes the training phase for the monkey. The madari knows that it will be difficult for him to train the monkey because of his fractious nature. But he also knows one more thing. Guess what? He knows he likes groundnuts. The madari keeps on feeding the monkey' groundnuts. He will starve him for them until he has learned a trick, which the madari wanted him (monkey) to learn. The monkey, slave of his desires, keeps learning new tricks, enslaved by the madari, because it has now became essential for his survival. Holding on to the groundnuts has payed nothing for the monkey. He keeps on doing the same mistake again and again. He could have easily pulled himself out of this trench if he had understood that for what he was fighting were mere groundnuts. It would have satiated his desire for a short time. But a mirage of a glorious present has kept him from contemplating over a miserable future. He could have dropped the groundnuts and freed himself. But instead of dropping those petty things he surrendered himself to his desires. Ever after getting trapped he never thinks that the same ploy has been adopted by madari to get his (madari) things done. Madari keeps on throwing groundnuts and the monkey keeps on dancing for him. Life is like that ' we often keep holding on to the groundnuts. The things, which are not really important for us. We lack the insight to see that life is something more than that. We remain slave to our desires and surrender ourself to it. In that case instead of we controlling our desires, our desires controls us. We become a monkey in the hands of our desire. One more thing we learn is that if we don't get rid of these 'groundnuts', then eventually at one point in life they becomes a necessity for our survival. Even if we want to detach ourself from it we cannot. The groundnuts we are talking about are things, which can make us happy for a short time. Life is about achieving new heights, challenging our attitude, coming out with something rewarding. No petty issues must stop us from going there. Unless we are able to draw a line between our desires and destiny, these groundnuts will keep on alluring us. We should not cling on to them so much that we become slaves in their hands. As a fist holding the groundnuts leading to the monkey's enslavement, it will hold our mind and thoughts making us its slave. New thoughts will fight for its liberation but will be mastered by old thoughts. These may easily act like groundnuts for us. Let them go away and we will feel a new freedom within and outside. This in another way may be looked upon as our 'misplaced priorities' in life. We tend to give more importance to the issues which are not of that importance, than the issues which really matter to us. A thing may be prioritised to be falling in anyone of these areas. Could do are the things which a person thinks he can do. This forms the gamut of all the things which are possible to do. Should do is a subset of could do. There are always some things which fall in this range. The must do as the name suggest are those things which are essential to us. Now it's entirely on an individual to find out what things to place where in his life. Wrong things placed at wrong position may lead to an unwarranted priority to that thing which may eat up the time and energy to be given to a more important goal of life. 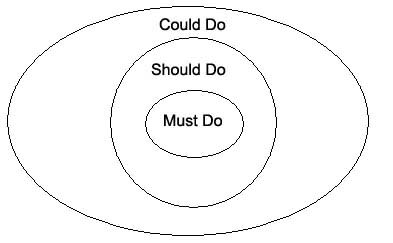 For instance, a thing which should be lying outside the 'should do' if placed in 'must do' and something taken from 'must do' to outside 'should do' is a misplaced priority. Once this is done than we start working for the not so important work putting the most important works in abeyance. We keep working on it spending energy, time and much more till we are drained out. Once we are able to teach ourselves the idea to put issues in their right place we will never struggle to find time for them or a will to pursue them. We need to learn the technique for doing it and the best way to learn it is to do it. We should contemplate over different things that surround us. Find out which needs more focus and are important to us in a long run or need immediate attention. These things are placed in 'must do' basket. The 'must do' are the almonds we are talking about and the things that lie outside the 'should do' are the groundnuts. Its up to us to pick the almonds or the groundnuts of our life. We need a bit of insight and instead of becoming slaves of our desires, dancing like a monkey on its tune, we can play our own tune by not getting attracted to the groundnuts of life. . Leave the groundnuts, work for almonds.